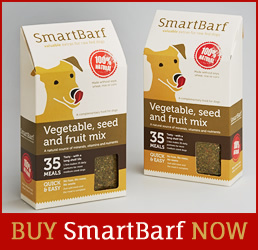 Mine isn’t a veg eater but he absolutely loves SmartBarf ☺️ A sample pack is well worth a try! I agree with that there is depletion of certain minerals etc in our soils, which obviously impacts on the content of those minerals in the livestock we feed... Add in the fact that many are no longer on pasture but have dried supplemented feed (kibble for farm animals) and it seems a good idea to get some of the natural herbs, seeds etc back into the bowl. I've just started using it, Dog loves it. I also noticed he doesn't seem to be eating grass as much now too. I used it on the recommendation of a holistic vet when one of my dogs was ill. I liked it. Would recommend. My girl likes it. I like the idea of the natural seeds and oils. We are the BCBruvz, we are litter brothers now aged 3yrs old. We are raw fed with the added yumminess of SmartBarf. Our pawrents have noticed a difference in us, plus our 6 monthly check ups always get a glowing response. We will always use SmartBarf. So here we are woofing to you all that SmartBarf is pawsome, forget all those expensive tablet/oil additives, add some natural goodness & your furbaby will be feeling fangtastic inside & out. Brilliant product - nothing else like it out there!! I was recommended SmartBarf by my dog trainer. I have an assistance dog with severe allergies and he was put on the raw food diet by my holistic vet 4 years ago, it changed my dog's life as a working dog he needed to be alert something he couldn't be with sore itchy skin. As a disabled person I found it so difficult buying and then liquidising a range of veg every week and freezing them, SmartBarf was a prayer answered, no way could I include all the good quality ingredients that SmartBarf has in each bag or balance it as well. Even if I wasn't disabled I would use this product as I know it's the best on the market, it's great value and my dog is fit healthy his skin is no longer sore and itching and he works every day for me so well, I couldn't manage without my assistance dog or SmartBarf. 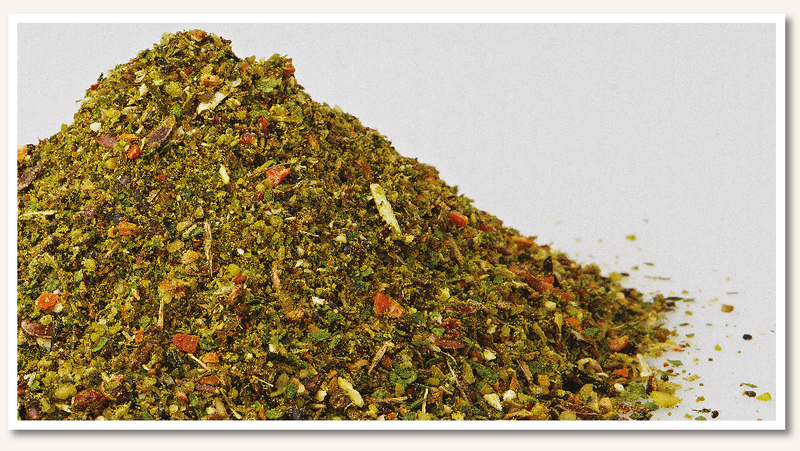 Having 3 large dogs – I was struggling to keep up with the preparation of vegetables, also I was using numerous herb supplements that were proving very costly. Before I learned of SmartBarf I was trying to source everything myself, but once again struggling on how much to give and when. I’m very pleased to have found SmartBarf as it seems a perfect and well needed solution to the DIY raw feeder. We have two collie cross dogs adopted from a rescue site. 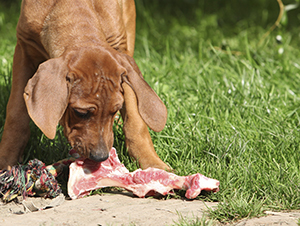 We have been feeding our dogs bones and raw food, since they were under a year old and after attending a session presented by a vet on the benefits of feeding BARF in preference to a diet of prepared food or kibble. The meat and bones element of the diet was easy to provide but adding the right mix of vegetables and vitamins was a challenge that proved difficult. We discovered SMART Barf a couple of years ago and have been using it mixed in with the raw meat every day since. It makes feeding the dogs a balanced diet so easy and we can be confident they are getting the nutrients they need. Their energy and effervescence is testimony to the feeding regime. One of the dogs used to eat faeces but stopped this habit as soon as SMART Barf was introduced into their diet. Thank you for a great product. I could not possibly have had the time to source all the ingredients plus all that is required to make it palatable for my dog. Smartbarf along with raw meat/fish diet has changed my dog completely. He now has energy, stamina and an increased appetite which the latter is a bit of a negative as it does cost more but the change is worth it. Have given the Smartbarf information to the vet, who, having looked at the bag and ingredients seemed quite impressed. Our dog Dexter (an 8 month old Dobermann who has always been given the BARF diet) seems to really like it. In the morning he always gets some form of mince and its nice to mix it in with the mince with a little extra water to give the mince a slightly less solid consistency. We still give Dex fruit and veg but at least I know he is getting the required vitamins and minerals every day. I have got to admit that I quite like the smell of it – am almost tempted to try it in a soup!! I am bowled over by this product, what a find! Feeding my dog a raw diet was a huge revelation and I would never go back. The only aspect that can be inconvenient and a little concerning is making sure my dog gets all the necessary vitamins, minerals and so on without the time-consuming hunt for all the right ingredients and supplements and using them in the right proportions and so on. So when I discovered SmartBarf all of those problems and worries were solved.